It is a very rainy day at Thanda and I am not driving today. So I was working in my office on pictures. I came across an interesting picture and I cut out a detail. Can you identify the species, the number of animals involved and the activity they are engaged in? Three animals? Brushing teeth, cleaning a body part, about to loose a tusk?? sparing or rubbing each other. Well done – Charles was the first person who identified it correctly – It is two Cape Buffalo (African Buffalo) bulls sparring! – I will post the picture in a few minutes. 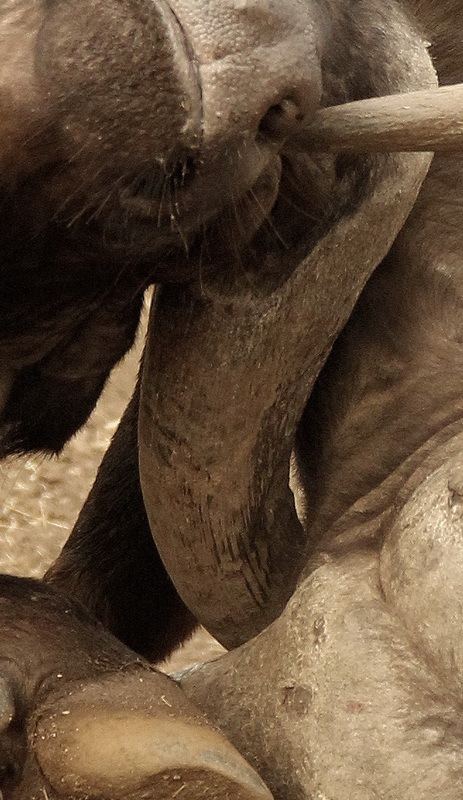 Two cape buffalo with tangled up horns?